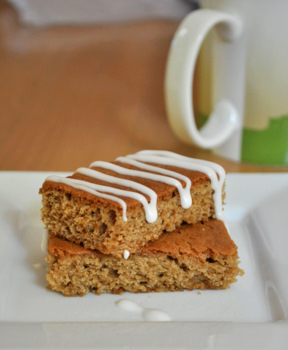 The only thing better than a delicious homemade cake is a delicious homemade cake that is easy to make. Piece of Cake! : One-Bowl, No-Fuss, From-Scratch Cakes is a book that is all about easy. The cookbook features dozens of recipes for cakes that require no special ingredients, no special techniques and can all be mixed up in just one bowl. 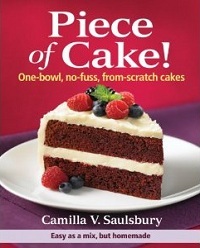 The idea of a one-bowl cake has been around for decades and one of the most well known is the “wacky cake”, which served as the inspiration for this book. A basic wacky cake recipe is given at the beginning of the book, but that is really just a jumping off place for a whole variety of recipes that take the simplicity of that one cake to a whole new level. The book is divided into chapters and includes all sizes and shapes of cake: single decker and loaf cakes, sheet cakes, bundts, layer cakes and pound cakes – as well as a wide variety of icings and glazes that can be paired with each recipe. The recipes are very easy to follow and the ingredients are very clearly laid out. Many of the recipes are accompanied by tips and suggestions for easy flavor variations, and most are accompanied by beautiful photos of the finished cake. The cookbook can be used by bakers of all skill levels, but is designed to be simple and non-intimidating for beginning bakers. In the introduction, ingredients are explained clearly and simply to make sure that you know exactly what you’ll need to get started. 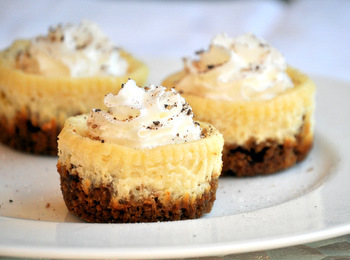 Although the technique used in the book is simple, one-bowl cake recipes often require that you use certain ingredients (full fat sour cream, as opposed to low fat, for instance) to ensure that you get the best results because it is easy to overmix the batter and toughen your cake. Overall, it is easy to get excited about the recipes in this book because they’re so easy to make. You’ll find yourself trying to streamline other recipes after using this technique, and turning back to it every time you’re in the mood to make dessert and want something simple.